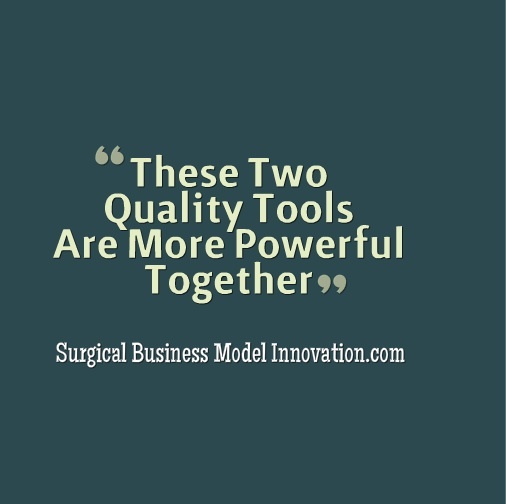 Using two quality improvement tools together can be more powerful than using one alone. One great example is the use of the fishbone diagram and multiple regression as a highly complementary combination. 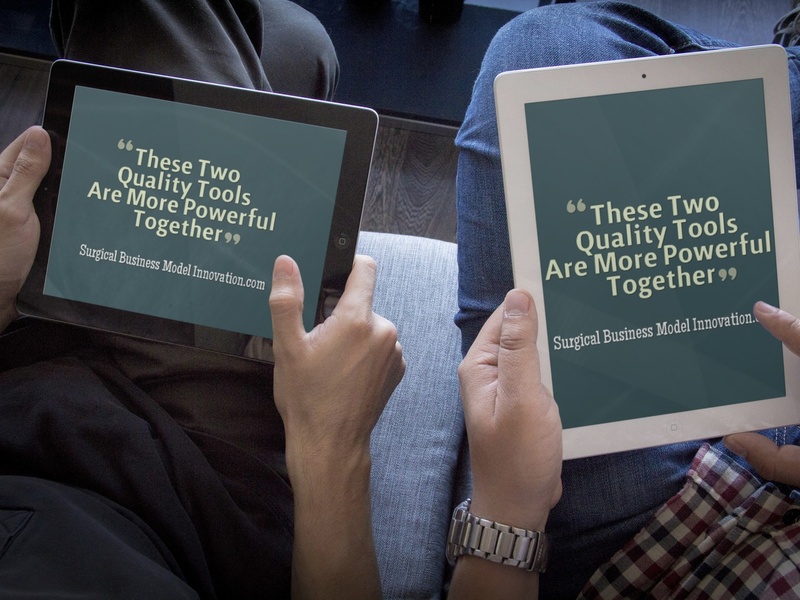 In this entry, let’s explore how these two tools, together, can give powerful insight and decision-making direction to your system. You may have heard of a fishbone, or Ishikawa diagram, previously. This diagram highlights the multiple causes for special cause variation. From previous blog entries, recall that special cause variation may be loosely defined as variation above and beyond the normal variation seen in a system. These categories are often used in root cause analysis in hospitals. See Figure 1. As you also may recall from previous discussions, note that there are six categories of special cause variation. These are sometimes called the “6 M’s’” or “5 M’s and one P”. They are Man, Materials, Machine, Method, Mother Nature and Management (the 6 Ms). We can replace the word “man” with the word “people” to obtain the 5Ms and one P version of the mneumonic device. In any event, the issue is that an Ishikawa diagram is a powerful tool for demonstrating the root cause of different defects. Although fishbone diagrams are intuitively satisfying, they can also be very frustrating. For example, once a team has met and has created a fishbone diagram, well…now what? Other than opinion, there really is no data to demonstrate that what the team THINKS is associated with the defect / outcome variable is actually associated with that outcome. In other words, the Ishikawa represents the team’s opinions and intuitions. But is it actionable? In other words, can we take action based on the diagram and expect tangible improvements? Who knows. This is what’s challenging about fishbones: we feel good about them, yet can we ever regard them as more than just a team’s opinion about a system? Using another tool alongside the fishbone makes for greater insight and more actionable data. We can more rigorously demonstrate that the outcome / variable / defect is directly and significantly related to those elements of the fishbone about which we have hypothesized with the group. For this reason, we typically advocate taking that fishbone diagram and utilizing it to frame a multiple regression. Here’s how. We do this in several steps. First, we label each portion of the fishbone as “controllable” or “noise”. Said differently, we try to get a sense of which factors we have control over and which we don’t. For example, we cannot control the weather. If sunny weather is significantly related to number of patients on the trauma service, well, so it is and we can’t change it. Weather is not controllable by us. When we perform our multiple regression we do so with all factors identified labeled as controllable or not. Each is embodied in the multiple regression model. Then, depending on how well the model fits the data, we may decide to see what happens if the elements that are beyond our control are removed from the model such that only with the controllable elements are used. Let me explain in greater detail about this interesting technique. Pretend we create the fishbone diagram in a meeting with stakeholders. This lets us know, intuitively, what factors are related to different measures. We sometimes talk about the fishbone as a hunt for Y=f(x) where Y is the outcome we’re considering and it represents a function of underlying x’s. The candidate underlying x’s (which may or may not be significantly associated with Y) are identified with the fishbone diagram. Next, we try to identify which fishbone elements are ones for which we have useful data already. We may have rigorous data from some source that we believe. Also, we may need to collect data on our system. Therefore, it bears saying that we take specific time to try to identify those x’s about which we have data. We then establish a data collection plan. Remember, all the data for the model should be over a similar time period. That is, we can’t have data from one time period and mix it with another time period to predict a Y value or outcome at some other time. In performing all this, we label the candidate x’s as controllable or noise (non-controllable). Next, we seek to create a multiple regression model with Minitab or some other program. There are lots of ways to do this, and some of the specifics are ideas we routinely teach to Lean Six Sigma practitioners or clients. These include the use of dummy variables for data questions that are yes/no, such as “was it sunny or not?” (You can use 0 as no and 1 as yes in your model.) Next, we perform the regression and do try to input confounders if we think two x’s or more x’s are clearly related. (We will describe this more in a later blog entry on confounding.) Finally, when we review the multiple regression output, we look for an r^2 value of greater than 0.80. This indicates that 80% of the variability in our outcome data, or our Y, is explained by the x’s that are in the model. We prefer higher r^2 and r^2 adjusted values. R^2 adjusted is a more stringent test based on the specifics of your data and we like both r^2 and r^2 adjusted to be higher. So, at the end of the day, the Ishikawa / fishbone diagram and the multiple regression are powerful tools that complement each other well. A trauma center had issues with a perceived excess time on “diversion’, or that time in which patients are not being accepted and so are diverted to other centers. The center had more than 200 hours of diversion over a brief time period. For that reason, the administration was floating multiple reasons why this was occurring. Clearly diversion could impact quality of care for injured patients (because they would need to travel further to reach another center) and could represent lost revenue. Candidate reasons included an idea that the emergency room physicians (names changed in the figure beneath) were just not talented enough to avoid the situation. Other reasons included the weather, and still other reasons included lack of availability of regular hospital floor beds. The system was at a loss for where to start and it was challenging for everyone to be on the same page to have clarity with respect to where to start and what to do next with this complex issue. 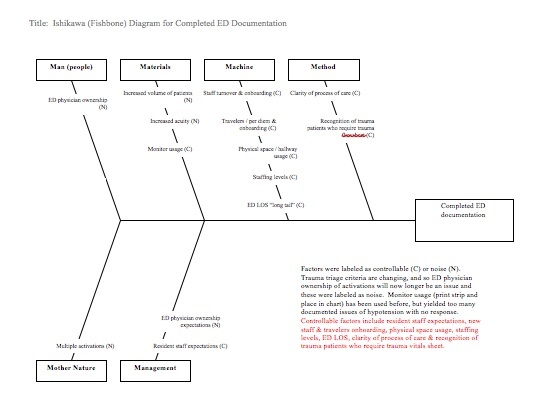 For this reason, the trauma and acute care surgery team performed an Ishikawa diagram with relevant stakeholders and combined this with the technique of multiple regression to allow for sophisticated analysis and decision making. See Figure 2. Variables utilized included the emergency room provider who was working when the diversion occurred (as they had been impugned previously), the day of the week, the weather, and the availability of intensive care unit beds to name just a sample of variables used. The final regression result gave an r^2 value less than than 0.80 and, interestingly, the only variable which reached significance was presence or absence of ICU beds. How do we interpret this? The variables included in the model explain less than 80% of the variation in the amount of time the hospital was in a state of diversion (“on divert”) for the month. However, we can say the the availability of ICU beds is significantly associated with whether the hospital was “on divert”. 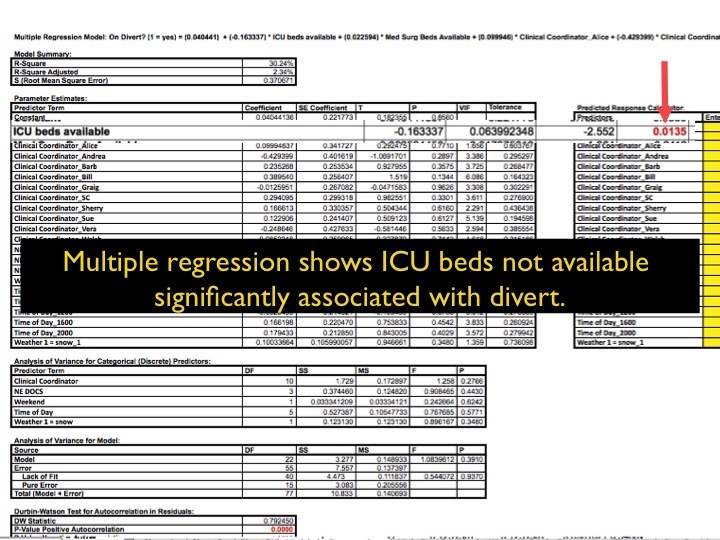 Less ICU beds was associated with increased time on divert. This gave the system a starting point to correct the issue. Just as important was what the model did NOT show. The diversion issue was NOT associated significantly with the emergency room doctor. Again, as we’ve found before, data can help foster positive relationships. Here, it disabused the staff and the rest of administration of the idea that the emergency room providers were somehow responsible for (or associated with) the diversion issue. The ICU was expanded in terms of available nursing staff which allowed more staffed beds and made the ICU more available to accept patients. Recruitment and retention of new nurses were linked directly to the diversion time for the hospital: the issue was staffed beds, and so the hospital realized that more nursing staff needed to be hired as one intervention. This lead to a recruitment and retention push, and, shortly thereafter, an increase in the number of staffed beds. The diversion challenge resolved immediately once the additional staff was available. In conclusion, you can see how the fishbone diagram, when combined with the multiple regression, is a very powerful technique to determine which issues underly the seemingly complex choices we make on a daily basis. In the example above, a trauma center utilized these powerful techniques together to resolve a difficult problem. At the end of the day, consider utilizing an fishbone diagram in conjunction with a multiple regression to help make complex decisions in our data intensive world. Thoughts, questions, or feedback regarding your use of multiple regression or fishbone diagram techniques? We would love to hear from you.